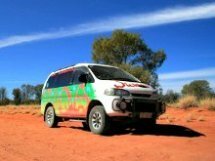 A travel van is a simple and extremely practical camper van conversion and your daily driver all combined in one versatile fuel efficient vehicle if you want to enjoy the world of van campers the cheap and easy way, and for some reason don't need to have a camper van just standing on your driveway until your next vacation time, this is the vehicle that you're probably looking for. Any kind of van will do just fine. 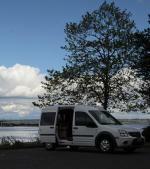 A mini van, medium sized van or regular size van can be converted to a nice, warm and comfy camping van. 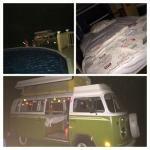 Always better then a tent if you ask me. No pop-top camper or high-top camper roofs here. 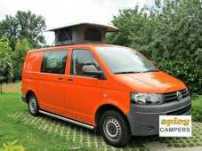 Just a straight-forward passenger van or panel van is what I'll talk about on this page. 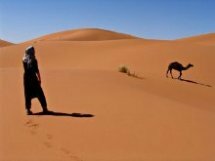 After all, everything you need for a great adventure is a good shelter, a comfortable bed to sleep on and some warm food and clothing. Depending on what you eat and drink a cooler might even be an optional here. 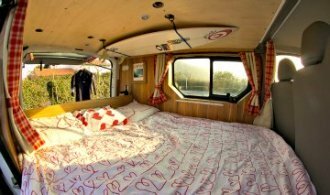 There are many types of practical and unique travel van conversions possible. 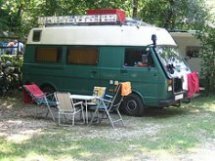 You can either get one done from a professional workshop or roll up your sleeves and build your own camper van...hmm, sorry travel van. Most regular passenger vans have a folding rear bench seat. All you have to do is figure out the best way of how to put a mattress on the top while you keep a pretty much large storage space below. 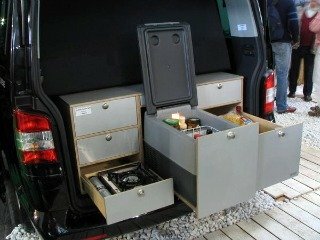 A neat solution is a camping box in the back of the van (behind the rear seats), with drawers or cup boards. Here you can store anything you want. You can even build in a small cooler, a cooker and a sink with running water. Play a little bit with your imagination here and you can build anything you need. This is actually the ultimate "do it all" vehicle. A car which you use for your regular transportation and a small travel van when you need it. 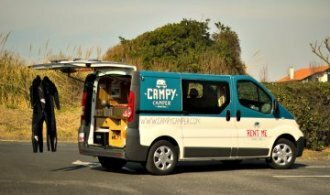 Check out the two videos below with two practical solutions for small passenger vans. They are both German manufacturers and in German language of course, but you'll get the general idea of what can be done. These are only two ideas just to get your imagination working again. 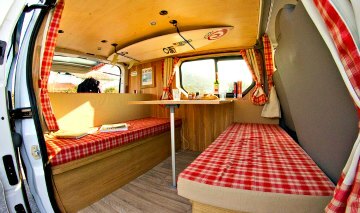 There are of course many other ways to do it and the British Amdro Alternative Campers have some cool ideas. Another fine example is a regular working panel van with two or three front row seats and having that you can do any kind of conversion in the back. 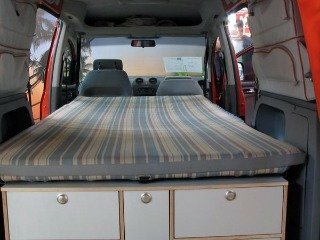 Depending on the size of the van and your needs you can build any kind of a wooden or metal structure and place a mattress on the top and even design a few cupboards on the side with an folding bench/bed combination or something close to it. It's all up to your imagination. You can also build two rows of seats facing each other and keep the utility things such as as the camping stove, sink with running water and the camping refrigerator all the way in the back and reachable by opening the rear door. A there will be plenty of storage under both seats for your camper accessories and camping gear. Your imagination is really the limit here, all you have to remember is that you can't have people seating in the back while driving in most countries of the world. Seats and seat belts do need to meet certain government regulations and after all, it's for your own safety and the safety of the people you will carry on board. 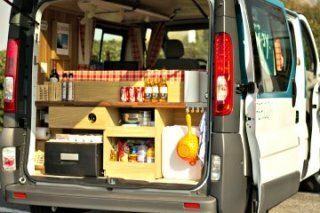 All the components can also be removable if you wish so, that way you can use your business van for your leisure time when needed. 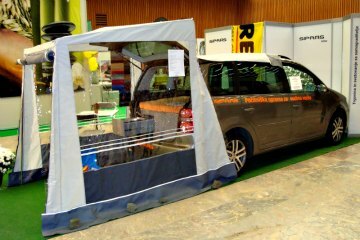 You can even attach anykind of camper awning to the side or the back for more room or weather protection on the camping site. Many people do it their own way. The above images and videos are merely a few ideas of what you can do with a little bit of imagination. And when I see them down the road, sit and chat with the folks driving them at night over a glass of wine....is there really anything more that you need to enjoy the great outdoors? 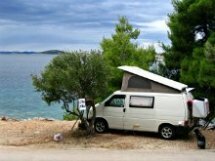 Are you touring around in your own travel van conversion or does your friend or next door neighbor have one you would like to share on this website? If you do, I'd love to hear from you! And camping enthusiasts always enjoy reading about something new to get some fresh ideas.